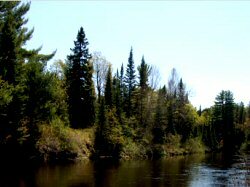 The Gwinn to River Road stretch of Escanaba River in Marquette County is 19 miles long and has been rated as a class I-II section by American Whitewater. The Gwinn to River Road section is one of many paddling sections in this river system. You might be into whitewater rafting or kayaking or both, doesn't matter, this is an area with plenty of places for that. And of course, there are campgrounds nearby. Escanaba River, Gwinn to River Road stretch is an easy place to go paddling. The nearby hotels are a bit away from the river, but if you don’t have reservations you might end up sleeping in your car. This section is recommended for beginner paddlers, it's probably ok to go paddling here even if you think your paddling abilities aren't very good. If you've been whitewater rafting and kayaking outside Michigan you might find the rivers here a bit more manageable, so better not forget that a lot of the rivers here are suitable for beginners. If you hurry you can run this stretch in a day but why not make it an overnighter, so why not pack your camping stuff too. It's an easy stretch for whitewater rafting and kayaking, you are not likely to get wet paddling here. The beautiful scenery of Marquette County and the sparkling of the sunlight on the water will make you feel great. This section has a high uniformity of rapids, different rapids along the stretch are similar to each other. Getting a good workout and just hanging out with mother nature will have you coming back for more.